Have an Android and wanna start pwning people, networks and machines like penetration testers do? 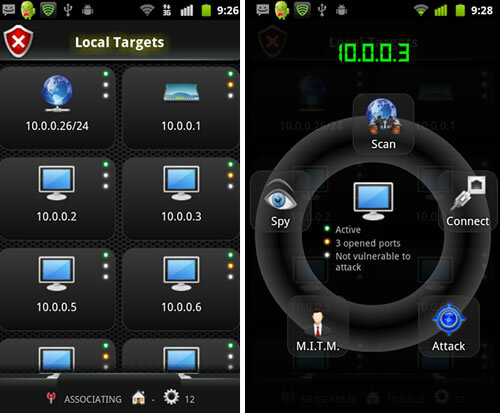 Defcon 2011 is in full hacking swing, and Itzhak Avraham — “Zuk” for short — and his company Zimperium have unveiled the Android Network Toolkit for easy hacking on the go. Need to find vulnerabilities on devices using nearby networks? The app, dubbed “Anti” for short, allows you to simply push a button to do things like search a WiFi network for potential targets, or even take control of a PC trojan-style. The firm says the tool’s purpose is for people to find aged exploits and patch them so that “hacking” their network and taking control of devices connected to it isn’t as easy as putting together a 10 piece puzzle. It will allow users to do more than just “find” these exploits, though – you can actually act on them as if you had every intent to cause malintent.Commands like “man-in-the-middle”, a snooping tool, and “attack” allow users to intercept data and control devices with the push of a button. $10 can buy you a “corporate upgrade” of Anti, but otherwise the free app will bring mobile and advanced hacking to the masses. Zuk will offer Anti in the Android Market this week. If you have known and unpatched vulnerabilities in your network or your devices, then you are a potential target so fix it or be prepare to be exploited. Consider this a warning you should heed. According to Forbes, it’s much like Firesheep, and Zuk refers to Anti as a “penetration tool for the masses.” Apparently, his end-goal is to simplify “advanced” hacking and put it within pocket’s reach, but he also hopes it’ll be used mostly for good. Anti should be available via the Android Market this week for free, alongside a $10 “corporate upgrade.” Consider yourself warned. This entry was written by Zac , posted on Friday August 12 2011at 09:08 pm , filed under Education & Training, Ethical Hacking/Pen-Testing, Mobile, Security, Vulnerabilities and tagged Android, ANTI, DefCon, Ethical Hacking, Firesheep, Hacking, Penetration Testing, Zimperium, Zuk . Bookmark the permalink . Post a comment below or leave a trackback: Trackback URL.